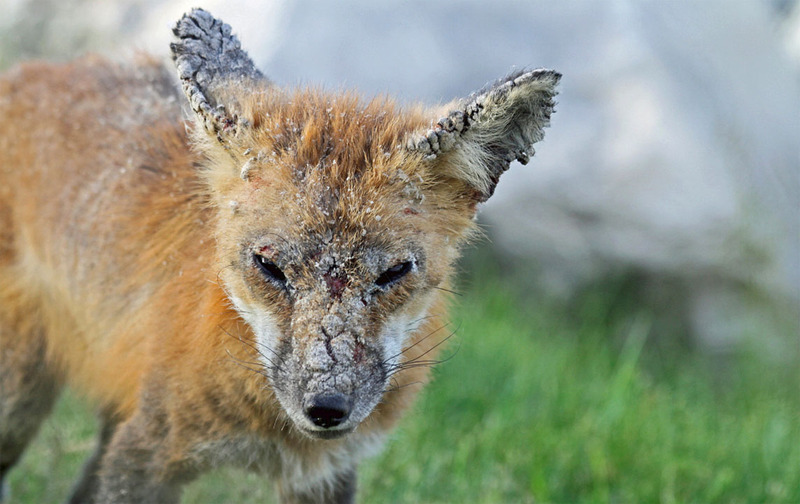 Summary: There are several different types of mange, each caused by a different species of mite, but sarcoptic mange most commonly affects foxes. Sarcoptic mange is a skin disease caused by the small (2 to 4 mm, or less than one-quarter of an inch) parasitic mite Sarcoptes scabiei, several thousand of which may burrow into a single square-centimetre of skin. Female mites burrow into the skin where they may live for up to a month. As the mite burrows, tissue fluids and debris are deposited on the surface of the fox’s skin forming an intensely itchy crust that causes the fox to scratch frequently. Scratching causes hair-loss and small cuts, which can then become infected. Conjunctivitis is also apparent in severe cases, giving the fox a 'crusty-faced' appearance, as are changes in behaviour; the infected fox becomes less and less active. Weight loss and organ damage are often evident and, if left untreated, death typically follows in four to six months. Mange can have a profound influence as it sweeps through a fox population and an outbreak in 1994 succeeded in wiping out 95% of Bristol's fox population in only two years. The most common treatment is the broad-spectrum anti-parasitic medication ivermectin, sold under the name Stromectol in the USA and Mectizan in Canada, although selamectin (an active ingredient in the medication Stronghold) is an effective treatment used by many vets and animal charities in Britain. Homeopathic remedies are sometimes employed for mild-to-moderate infections, the most common probably being arsenicum album and sulphur 30c. The National Fox Welfare Society (NFWS), for example, sends out about of these 70 free treatments every week. There is, however, no clinical evidence that homeopathic remedies have any effect, because they are essentially water. Nonetheless, many letters from members of the public on the NFWS’s website testify to apparent improvements seen with these remedies. Recently, essential oils, particularly clove and tee tree, have been shown to kill the Sarcoptes mites by both direct (topical) application and fumigation. Mange is a persistent contagious skin infection caused by a parasitic mite. There are two types of mange generally found among members of the dog family, classified according to the mite that causes the infection. Demodetic mange, sometimes called demodicosis or ‘red mange’, is caused by mites of the Demodex genus (typically D. canis in domestic dogs) that live in hair follicles and are usually only problematic for animals with a weakened immune system. Much more common and more severe, particularly in wildlife, is Sarcoptic mange. Sarcoptic mange is caused by the mite Sarcoptes scabiei, the name comes from the Greek sarkos for ‘flesh’ and koptein meaning ‘to cut’, and the Latin scabare meaning ‘to scratch’, which sums up the symptoms succinctly. In humans, S. scabiei causes scabies, while in all other animals the same condition is called mange. It is worth quickly noting that there is a third type, Notoedric mange, or feline mange, which is caused by the mite Notoedres cati that only very rarely infects other animals. Sarcoptes are mites and, as such, they have eight legs and are classified along with the spiders and scorpions in the Arachnida class; more specifically they are grouped together with the ticks in the taxonomic order Acarina. The 2001 book Parasitic Diseases of Wild Mammals, lists 105 species known to be susceptible to infection by S. scabiei including most domestic livestock, chimps, foxes, badgers, hedgehogs, squirrels, deer, lions, cheetahs, wolves, pine martens, stoats, red pandas, polar bears, seals, porcupines, hares, koalas and wombats. The observation that Sarcoptes mites generally show a preference for certain host species led some authors to divide them into distinct species. The mites causing the fox mange, for example, would therefore be Sarcoptes vulpes. Not everyone was convinced by this and, in a 1968 paper, Belgian parasitologist Alex Fain presented a detailed morphological and life history study of this mite and argued that, although there was considerable variation among some of his subjects, it wasn’t sufficient to separate them from the type species. In other words, they’re all just Sarcoptes scabiei. Some 30 years later, Fain’s conclusions were confirmed by a team of parasitologists based in Germany, who found no genetic evidence to support taxonomic separation of S. scabiei into distinct species; they concluded it was a single, variable species. There are, nonetheless, several studies showing that mites transferred from their primary host to an alternate one, from a fox to a human for example, rarely survive more than a few days, suggesting some degree of host adaptation. Indeed, in a fascinating paper to the Journal of Parasitology during 1996, a team of researchers at Wright State University in Ohio reported that mites infecting pigs, dogs and humans each produced their own set of unique proteins which they injected into their host. There is still much to be discovered about the specificity of this mite but, ultimately, the current view is that Sarcoptes scabiei is a single species with many ‘variants’, which are loosely grouped according to their preferred hosts. Mange mites infecting foxes, for example, are generally referred to as Sarcoptes scabiei var. vulpes, while those that parasitise domestic dogs are S. scabiei var. canis, those infecting pigs are var. suis, those causing scabies in humans are var. hominis, and so on. These variants are generally widely accepted, although some authors consider var. vulpes and var. canis to be the same (lumping them together as var. canis) because dogs and foxes can catch mange from each other and, as Set Bornstein put it in a 1991 paper, “It is not possible by morphological features to distinguish between S. scabies var. vulpes and var. canis” – in other words, the mites look identical. Fox mange is most commonly sarcoptic. Notoedric mange is apparently very rare among foxes, although in his 1980 opus Red Fox, Huw Gwyn Lloyd suggested that it may be more common than the literature implies, referring to several foxes in Cheam, Surrey that were apparently severely infected with this mite during 1969. Foxes can contract mange from various sources, including direct contact with infected individuals (including infected carcasses), and areas of the territory through which an infected animal has passed. Indeed, the mites can survive in the environment for several days waiting for a host. In 1958, Russian ornithologist Yuri Gerasimov demonstrated that mites could be transmitted to uninfected foxes inhabiting earths (dens) that had previously been used by infected individuals; the Russian outbreak was controlled by fumigating earths. Gerasimov also found that larval mites could survive on the ovipositors (egg-laying appendages) of flies for around 24 hours after the insect had landed on a carcass infected with mange; this raises the possibility that mites might hitch a ride on flies, without parasitizing them, as a means of moving to a new host, a mechanism known as phoresy. More recently, it has been found that fluid exuded from wounds caused by the parasites can contain many millions of mites and this probably represents a significant potential source of contagion if left on a fence or at a daytime lying up site. However the fox comes to be infected, laboratory studies have demonstrated that the mites quickly spread. Male mites mate with females once before dying and, upon arriving on a new host, it takes her about ten minutes for her to start burrowing into the outermost layer of the skin (the stratum corneum); she generally creates a burrow in this layer, although she may penetrate much deeper, into the stratum germinativum. The mite uses cutting mouth-parts called chelicerae and specialised hooks on her legs to cut into the skin and is usually fully submerged in just over 30 minutes. As she burrows, she feeds on tissue fluid called lymph and lays her eggs. The eggs hatch into larvae and subsequently metamorphose into nymphs that extend their mother’s burrow system; thus the infection spreads over the fox’s body as the mite population increases. In their 2001 book, Urban Foxes, Bristol University biologists Stephen Harris and Phil Baker note that a severely infected fox may be host to several million mites, while scientists at the University of Georgia have found densities approaching 5,000 mites per square centimetre (or over 32,000 per sq-inch) of skin. Once the initial contact has been made between the mite and its host there will be a period during which the fox is asymptomatic (i.e. shows no signs of having mange) while the mite population increases. The time taken for symptoms to develop is referred to as the incubation period and varies according to the individual and the number of mites transferred in the initial infection (i.e. the size of the founding population). It appears that foxes that have previously been infected and recovered are hypersensitive to re-infection. In other words, symptoms develop sooner than they did first time around. In a series of experiments on captive foxes, biologists in North America found that a moderate application of mites (about 500) led to an incubation period of 20 to 30 days, while a high application (around 2,000 mites) had an incubation of only 9 or 10 days. A similar set of experiments, conducted by parasitologists in Sweden during the early 1990s, found that a low application load (about 200 mites) to three captive foxes produced the first symptoms 31 days later, around the same time that antibodies to S. scabiei var. vulpes appeared in the animals’ blood, increasing until more severe symptoms developed 49 to 77 days after the initial infection. Experiments by Susan Little and her colleagues suggested that contacts between captive foxes resulted in about 5,500 mites being transferred between individuals during infection and re-infection. Captive contact rates may not mirror those in the wild, but are probably more reflective of transmission within urban populations. Symptoms of mange vary according to the severity of the infection. Low-level infection may present as little more than localised itching and mild hair loss. At some point, however, more severe symptoms usually develop. As the mite burrows and feeds, lymph and debris (e.g. eggs, egg cases, live and dead mites, mite faeces and digestive secretions) ooze out on to the skin’s surface and harden into a ‘crust’ that can be relatively thick. In a short paper to Veterinary Record, parasitologist Peter Bates reported on a young dog fox found dead from mange in a hedgerow on a farm in Surrey during November 1990 that had 1.5cm (just over half-inch) thick scabs covering its back. The burrowing and excretions cause intense irritation and foxes typically present with intense pruritus (itching). During the 2001 mange outbreak in Wales, farmers reported intensely pruritic foxes stopping to scratch vigorously several times when crossing a small field. Intense scratching, licking and gnawing at infected areas causes wounds that scab over, a process called hyperkeratosis, and this combined with the skin excretions causes the fur to be lost. The loss of fur is a condition known as alopecia, from the Greek word alopex meaning ‘fox’ and the suffix –ia used to signify disease; so literally ‘fox disease’. Alopecia is localised at first, usually beginning around the haunches and base of the tail, which is presumably related to the area being heavily scented and a site of social communication. Foxes often sniff each other’s violet glands, an area of skin located near the root of the tail, when meeting and this may facilitate mite transmission. The alopecia spreads quickly forwards, with fur lost from the back and flanks. Shortly after fur loss begins on the rump, symptoms are often quick to manifest on the head, most likely transferred while the fox is grooming the affected area. As the infection spreads, the hair loss increases along with areas of raw skin, damaged during scratching and grooming. The intense itching proves distracting and can hamper the fox’s ability to hunt and cause it to lose condition. Perhaps more importantly, without fur the fox struggles to maintain its body temperature, particularly in cold and/or wet conditions. In the advanced stages, a fox will often enter outbuildings such as sheds and greenhouses in an effort to keep warm. To the best of my knowledge, not data on heat loss from foxes suffering from mange exist, but a recent study of grey wolves (Canis lupus) in Yellowstone National Park offers an insight. The study was conducted by a team of 12 researchers, led by Paul Cross at the Northern Rocky Mountain Science Center. Between October 2010 and November 2011 wild and captive wolves were filmed with thermal imaging cameras to record their surface body temperature. The researchers also fitted some of the wolves with GPS collars and tracked their movements. The tracking data clearly showed that the wolves tried to offset the energy loss associated with mange by moving around less. Animals with mild mange (less than5% hair loss) reduced their movement by 1.5km (just under a mile) compared to healthy wolves, while severely infected animals moved around by 6.5km (4 miles) less per day. As the animal’s condition deteriorates, it becomes susceptible to secondary bacterial infections, caused by opportunistic microorganisms (e.g. Streptococcus and Staphylococcus bacteria) living on the skin. Indeed, in their book Urban Foxes, Harris and Baker described a ‘musty odour’ associated with severely infected individuals and, in his 1980 book Red Fox, Lloyd noted how affected animals develop a “characteristic sweet, ‘mangy’ odour, which may be due to a secondary bacterial infection”. Conjunctivitis is also common in the late stages of the disease, giving a swollen-eyed crusty appearance to the face. In the end, the bacterial infection, starvation and hypothermia, if untreated, prove fatal within a few weeks. The general mammalian immune response to a parasitic infection is to destroy the invader by coating it with antibodies that make it susceptible to attack by phagocytes (white blood cells). Special white blood cells, called eosinophils, home-in on the antibody-coated intruder and release a collection of peroxides and proteins that attack the parasite. We know that some mammals, about 40% of humans and over 80% of domestic dogs, for example, launch an immune response to Sarcoptes mites, which means that if they’re re-infected they can fight it on their own. The situation in foxes is unclear. In a 1998 paper to the Journal of Wildlife Diseases, a team of biologists at the University of Georgia described the responses of foxes to infection and re-infection with sarcoptic mange. The researchers found that their foxes developed mange within two weeks of initial infection, after which they were treated and the condition cleared up. When exposed again, however, the foxes contracted mange again, with no signs of it being any less severe than the first time. In some cases, the foxes remained ‘hypersensitive’ to the mites for four months after they’d recovered from the first infection. This study suggests that, unlike most canids, foxes do not launch effective immune responses against the parasite. In a 1976 paper on foxes in mid-western North America, however, Gerald Storm and his co-workers suggested that these animals may be able to recover from mange on their own, while, in 1995, Set Bornstein and colleagues described a fox suffering from prolonged low-level mange that never progressed to severe mange, suggesting the fox’s immune system was keeping the mites “in check”. Scientific papers aside, the general observations of veterinarians and animal charities seems to be that foxes rarely recover from severe mange on their own, and most die within four-to-six months without treatment. Indeed, in his 1994 book The Complete Fox, the late St. Tiggywinkles co-founder Les Stocker pointed out that, prior to their work, mange was considered an incurable disease and infected foxes were killed. Fortunately, these days mange is a relatively easily treated disease and even severely infected animals can usually be nursed back to full health. There are two major medications commonly employed to treat mange: the broad-spectrum (i.e. ‘kill all’) anti-parasitic ivermectin (Stromectol in the USA or Mectizan in Canada); and selamectin, which is found in tick and flea treatments such as Stronghold. Both medications are acaricidal, which means they kill the mites. Ideally, medication should be administered in situ, given to the fox in some food, rather than the fox having to be trapped and treated at a clinic. Capturing the fox is invariably stressful for the animal and foxes are territorial, which means that upon release the fox might find its territory has been taken over. Hospitalization is generally seen as a last resort. Unfortunately, while relatively low-level mange can be treated with medication in food, many severe cases make hospitalization unavoidable as the animal (which may be almost bald) needs to be kept warm and requires a transfusion of fluids and antibiotics to treat dehydration, mange and secondary bacterial infections, such as conjunctivitis. Where treatment in situ is possible a few drops of medication can be put into food given to the fox; often several treatments are required. Ivermectin can be taken orally and yields good results, but is toxic to some breeds of dogs with a particular genetic mutation that allows the drug to pass across the blood-brain barrier into the brain – collies, old English sheepdogs, Jack Russels are all susceptible to Ivermectin. Consequently, it is important that only the affected foxes eat the medicated food and this potential uncertainty can make vets reluctant to prescribe it. Alternatively, although not licensed as an oral treatment, following consultation with the manufacturer, Vale Wildlife Rescue found that Stronghold can be administered in food with excellent results. That said, most medications are under veterinary prescription, which means they can only be prescribed to animals ‘under treatment’ – i.e. the vet needs to see the fox. You should always seek veterinary advice before attempting to administer any medication. When administered correctly, both medications have success rates approaching 100% and symptoms clear up within two to four weeks. Moreover, these acaricides remain active in the fox’s body for between two and four weeks after treatment, offering some limited protection from reinfection. Herbal or homeopathic ‘treatments’ are sometimes offered as an alternative to mainstream medications. The basic premise of homeopathy is that using very dilute (and thus essentially “safe”) solutions of some active molecules can trigger the body’s immune system to fight off an infection. I won’t go into the details or claims of efficacy because I know of no scientific data showing homeopathy is any more effective in treating medical conditions than placebos. It is enough to say most reputable medical, veterinary and governmental bodies will not endorse it. Nonetheless, the homeopathic remedy arsenicum album and sulphur 30c is commonly given to foxes suffering from mange; a few drops added to food given to the fox every day for three weeks. The National Fox Welfare Society (NFWS), for example, send about 70 treatments every week for free, at a net loss to them of about £10 ($16 or €12) per time. They also apparently use it to “treat” foxes taken into their sanctuary in Northamptonshire. On their website the NFWS have many letters from people who have used this treatment with apparently excellent results. The Fox Project in Kent note similarly spectacular results when treating with arsenicum. The NFWS note on their website that this remedy is ineffective on foxes with moderate mange, where fur loss exceeds 50%, while the Fox Project point out that it is less successful at treating foxes with more than 30% alopecia. I have seen photos from readers showing foxes before and after homeopathic treatments, showing a healthy-looking animal. In most cases, all that was offered was the remedy, food and vitamin supplements. How does the homeopathic treatment work? The short answer is that, if it works, we don’t know how. It is fairly easy to understand how veterinary medications, such as ivermectin or Stronghold cure the fox. Selamectin, the active component in Stronghold for example, becomes systemic (i.e. it’s absorbed into the blood) and circulates around the body, including the skin; the mites ingest the selamectin as they feed and it interferes with their nervous system, causing death. Ivermectin works in a similar way. There is, incidentally, some indication that topical treatments (e.g. Frontline) may also be effective, although these don’t become systemic; they dissipate through the grease-layer of the skin to reach the mites. It is much more difficult to understand how homeopathic remedies can have any impact, because they are essentially water. In the case of this particular remedy, we know it’s a 30c treatment – this tells us the dilution, with the number preceding the ‘c’ expressing the number of zeros. In other words, there is one part arsenicum to 1,000,000,000,000,000,000,000,000,000,000 parts water. Hence, it is difficult to see how arsenicum can retain any activity when diluted one quintillion times. It’s a bit like ordering a pint of larger in a bar only to see the barman take the pint, pour it into an Olympic-sized swimming pool of water, refill the glass from the pool and giving it to you. Furthermore, we have no evidence that arsenicum at any concentration can actually kill the Sarcoptes mite. It’s easy enough to ascribe a “placebo effect” among human patients in a clinical trial, but it seems a stretch to believe that the same could be applied to foxes, who don’t know they’re being treated. Interestingly, though, in a paper to the Veterinary Record in 2005, Lisbeth Hektoen at the Norwegian School of Veterinary Science described how giving placebos to animals can cause their owners to think that their pet’s condition is improving even when it isn’t, suggesting our objectivity is biased when we think treatment is being provided. Most will argue that photos don’t lie, though. On their website, the NFWS suggest that, despite its negligible concentration, the homeopathic treatment improves the fox’s overall condition, healing the skin and helping restore vitamin and mineral imbalances, thereby hampering the mite’s lifecycle and making the fox more able to cope with the infection on its own. It is certainly true that mangy foxes are generally underweight. In a study published in the Canadian Journal of Zoology during 2002, a team of Bristol University biologists led by Tabetha Newman report on the nutritional condition and survival of foxes with mange. The researchers looked at the carcasses of 51 foxes collected from the UK between 1997 and 2000 and found that class I (low-level mange) animals weighed, on average, 15% less than uninfected animals, while class II (severe mange) animals weighed 33% less. The biologists also found that some class II animals showed signs of muscle wastage. (When fat reserves are exhausted, the body starts metabolising protein for energy; a bit like pulling up the floorboards in a house to fuel a fire.) The authors concluded that foxes infected with mange show symptoms of malnourishment that increase as the disease takes hold and it’s interesting to note that this is the case even in urban Bristol, where food is plentiful. It has been suggested that fear, pain and/or stress may lead to anorexia in foxes, as is well known in other animals – even as humans most of us know how illness or stress can put us off our food. If the remedy contains vitamins and minerals this may correct any biochemical imbalances in the fox, improving its general health and therefore its potential for fighting disease and infection itself, while the supplemental food provided by the person giving the remedy similarly helps improve the fox’s condition. (Immunocompromised animals struggle to fight off infections and it may be that the simple act of feeding the fox helps it recover; nothing to do with the remedy.) We’ve seen in Bristol that a lack of available food isn’t obviously the issue here, but there may be a quality vs. quantity effect – if householders put out higher quality, or more palatable (sugary) food with the treatment the fox might be more tempted to eat it. Alternatively, the fox may just live with a low-level mite infection that flares up only if the animal becomes malnourished or sick from some other source. I have seen some suggestion that the remedy also contains chemicals that make it into the blood and are distasteful to the mite, but I know of no evidence to support this. Finally, there may be an element of coincidence. We know a proportion of foxes recover on their own, without treatment. Furthermore, fox territories generally encompass several back gardens and mangy foxes tend to be rather conspicuous; it’s possible that while somebody at one end of the street is feeding a homeopathic supplement, one of their neighbours may be providing medication. Herbal remedies can be more effective and recent research by French and Chinese parasitologists has suggested that some ‘essential oils’ may also show promise in treating Sarcoptes mite infections. In a 2016 paper to the journal Parasites & Vectors, a team led by Fang Fang at Guangxi University in China reported on the effect of 10 essential oils on Sarcoptes scabei mites kept in petri dishes. The researchers found that, when applied directly to the mite, a 1% solution of clove and palmarosa oil (diluted with paraffin) killed the mites within 20 and 50 minutes, respectively. In order of effectiveness against the mites, the team observed that, in direct contact trials, clove oil was the most effective, followed by palmarosa, geranium, tee tree and lavender oils. Oils such as bitter orange and manuka and eucalyptus were much less effective and cade oil had no effect on the mites. When the mites were exposed to the same oils in a vapour (inhalation) trial, tee tree proved most effective, followed by clove and eucalyptus. Feng and his co-workers suggest that the major active components of these oils, eugenol in the case of clove oil and geraniol in palmarosa oil, directly penetrate the cuticle layer of the mite where it may interfere with their nerve system. This work builds on an earlier study, by University of Queensland biologist Cielo Pasay in 2010, which found that a 1.6% solution of clove oil killed all mange mites within 15 minutes of application. It should be noted that these studies show only that these oils are effective at killing mites in a petri dish in a lab and this does not necessarily translate to effective treatment of an infected fox. These are promising findings, nonetheless. Clinically, it would be fascinating to see studies systematically comparing supplements to medications, but such trials are, justifiably, hampered by ethical, time and cost considerations. Many foxes will continue to receive homeopathic remedies for the simple reason householders can obtain it free and without prescription and, in the end, the important outcome is that the fox is cured; how it happened is of secondary importance to most people. I have touched upon the observation that Sarcoptes mites show a preference for, perhaps even adaptation to, certain host species, which makes cross-contamination less likely. Some species do appear more susceptible than others, however. In North America during 1972, Gerald Stone and his colleagues conducted a series of experiments to see what other species they could successfully transfer Red fox mites to. Mites were freely interchangeable between foxes, dogs and coyote-dog hybrids; but skunks, rabbits, grey foxes, raccoons, opossums, rodents and cats all failed to sustain the infection. Indeed, transfer of var. vulpes mites to cats is rare and, on their Fox Website, the Bristol University biologists point out that between 1973 and 2006 there were only 11 such cases worldwide. Cats are susceptible to mange, but they usually contract the mite Notoedres cati. While Stone and his team found they couldn’t move the var. vulpes strain of mite to most of the wildlife they looked at, there has been some indication that foxes can infect badgers (Meles meles), with whom they sometimes share setts. In a recent letter to the Veterinary Record, a team of RSPCA and Veterinary Laboratory Association vets described a case of severe sarcoptic mange in an adolescent female badger from south-west England, suggesting that cross-contamination from foxes sharing the sett was a possible source of infection. Foxes can transfer their mites to humans, although var. vulpes is not a strain that normally infects people and the mites tend not to survive long. Indeed, in a brief article to EcoHealth, Peter Rabinowitz and Zimra Gordon reported on the case of a wildlife carer who went to her dermatologist complaining of an itchy, lumpy rash that had developed on her neck and chest just over a week after she handled a mangy fox; she was treated with a Lindane cream that cleared the rash up in two weeks. The vet to whom she took the fox also developed a similar itchy, lumpy rash on her stomach and chest, which she did not treat; it resolved itself within a couple of weeks. It seems that although the var. vulpes strain can burrow into humans, it cannot reproduce and thus the population dies out. Over the previous two months, the vet recalled having treated several dogs, living near the golf course where the fox was caught, for mange. Domestic dogs appear particularly susceptible to contracting mange from foxes and can also give foxes mange. A series of experiments by Set Bornstein during the late 1980s found that captive beagles caught mange and developed clinical symptoms (i.e. itching, redness, crusty skin, etc.) within a couple of weeks of being exposed to a piece of skin taken from a wild fox. When the fox skin was pressed on to their backs, the incubation period was 6 to 9 days; if just attached to the side of their cage it took between 11 and 13 days for symptoms to manifest. The dogs started losing fur within three weeks of infection. Bornstein’s studies were obviously conducted in confined quarters, but there are reports suggesting transfer may be similarly rapid in the wild. An outbreak in Sweden during the mid-1970s, for example, resulted in local dogs contracting mange almost as soon as the epidemic appeared in the fox population. Similarly, in a letter to the Veterinary Record during 2003, W. A. Scott described how, shortly after a fox family with serious mange in Falmouth died, local dog owners started reporting cases of mange in their pets. As with foxes, treatment of pet dogs involves a course of acaricide, such as ivermectin or Stronghold. Sarcoptic mange outbreaks in Australia during the 1940s and 50s reduced the fox population by an estimated 80% and the disease is endemic in many populations throughout Europe, Russia and North America, where there are reports from Ohio and Pennsylvania dating back to the 1950s. The UK has a long history of mange (see Brian Vezey-Fitzgerald’s Town Fox, Country Fox for a review), with an outbreak recorded in the New Forest in Hampshire in 1789, during which the Lord Warden of the Forest worried about the ‘great scarcity of foxes’. In his 1980 book, Red Fox, Lloyd recounts how 18th century hunters were among the first to recognise the disease, as fox hunting became popular, and British landowner and huntsman Peter Beckford wrote about it in 1810. Lloyd goes on to describe how New Forest naturalist Gerald Lascelles wrote about an epidemic of mange that began in 1895 and raged over much of England for three years before fox numbers began to recover; foxes apparently plentiful again by 1905. Mange has been epidemic in much of south and south-east Britain since the 1940s but, more recently, Britain experienced a significant mange outbreak that started in Bristol and decimated the fox population. I don’t plan to cover this in much detail here; it is discussed further in the main Red fox article. Mange is often perceived as being a feature of urban living, but this is not actually the case. There is little evidence that urban areas are poor quality habitats for foxes, or that urban animals are more prone to disease than rural individuals. Indeed, the first recorded outbreak among Bristol’s urban foxes was contracted from a nearby rural population. The first fox to be infected was a juvenile male that returned to his family group in the spring of 1994 having dispersed out of the city the previous winter; during this time, he was spotted on the rural fringes to the west of the city, where mange was known to be present in the local foxes. The biologists at Bristol University captured the animal in May 1994, at which point he was so severely infected with the disease that the decision was taken to euthanize him. Following this, mange was reported in foxes throughout the city, spreading at a rate of almost a kilometre each month, with infections appearing in domestic dogs a month-or-so after it was reported in the fox groups. The epidemic spread throughout the city and, in only two years, the fox population had been reduced by an estimated 95%. With this massive reduction in density came some interesting behavioural changes; the foxes expanded their territories, travelled more widely, changed rest sites more often, and used allotments and woodlands more often than the back gardens they frequented before the outbreak (partly, it seems, because fewer people were leaving food out for the foxes as they rarely saw any). Fortunately, Bristol’s fox population has been studied continuously since 1977 and a massive amount of data have been collected; the mange outbreak allowed a unique opportunity to look at how quickly fox populations recovered. The answer, it seems, is very slowly. By 1999, the population was still less than 10% of the pre-mange density and even by 2004 (a decade after the first case) it was only 15% of that of 1994. It seems that even today, the population is still not at 1994 levels, although it has probably stabilised at a new lower level. The reason why foxes take so long to recover from these epizootics (wildlife epidemics) appears to be related to the impact the mite has on breeding performance and population structure. The population is rapidly reduced with heavy mortality of both young and adult foxes. Indeed, cubs may be particularly susceptible as they don’t have a full-strength immune system, receive a lot of attention from other group members, and share the earth with their siblings. The population is then kept low by greatly reduced breeding activity. In his 1969 book, They All Ran Wild, Eric Rolls noted that foxes in the grip of a mange epizootic often failed to breed. Similarly, in a 2007 paper to Mammal Review, the Bristol University team described how severe levels of infection were associated with a lack of breeding females and an increase in male foxes that failed to produce sperm. The biologists concluded that in the advanced stages “mange is sufficiently debilitating to limit individual reproduction” and fewer breeding females, along with more young foxes dying make it difficult for the population to recover. Low fox numbers can then have a significant influence on other species. We know from experiments where foxes are controlled on game estates and around breeding bird colonies that fewer foxes generally translate to more prey species. In a study of foxes in the Grimso Wildlife Research Area in south-central Sweden, a group of biologists at the Swedish University of Agricultural Sciences found that while fox populations were kept low by mange during the late 1970s and early 1980s, populations of grouse and hare increased and there was a 30% increase in the number of Roe deer kids. As the fox population began to recover in the late-1980s, the numbers of hares and grouse declined once again. In their paper to the journal Ecology in 1994, the researchers concluded that foxes were key in structuring small game communities in their area by keeping prey populations low. Thus, large-scale mange outbreaks have the potential to lead to increases in prey populations as well as the densities of predators and other animals with which foxes compete for food (pine martins, badgers, hedgehogs, etc.). Note: I would like to extend my sincere thanks to Caroline Gould and Tim Partridge from Vale Wildlife Rescue for taking the time out of their busy schedules to answer my incessant questions about mange treatment and provide me with so many photos.